The following options in 'General' tab are used for every account. You can use some convenient options, for example, automatic connecting function, password function for starting up, and so on. ForwardMail will connect to server automatically just after starting up. It can be delayed for the specified seconds(1sec - 60sec). This option can't be used for the trial version. ForwardMail will be put into the tasktray on your desktop when starting, and the small icon of ForwardMail will appear on the tasktray. If checking this option, the password will be required when starting up. The password can be determined within 10 letters. If you would forget the password, you have to remove the preference file to launch the program. The settings will be removed and have to be set again. Incoming mails on your mailbox will be removed when you quit ForwardMail. You can choose the option that you need confirmation or not. Be careful to use this option. If checking this option, the update information will not be shown. Unchecking this option is recommended. If the same mail is found in the forwarding log, don't forward it: ForwardMail will check the Message-ID of past forwarded mails and avoid to forward the same mails again. You can choose the Message-ID checking option. Checking this option and choosing 'Check by each account' recommended strongly. Discard half of the older forwarding logs automatically when... : A half of the older history logs will be discarded when the history gets more than specified number of logs. Checking this option and specifying '2000-4000' recommended. 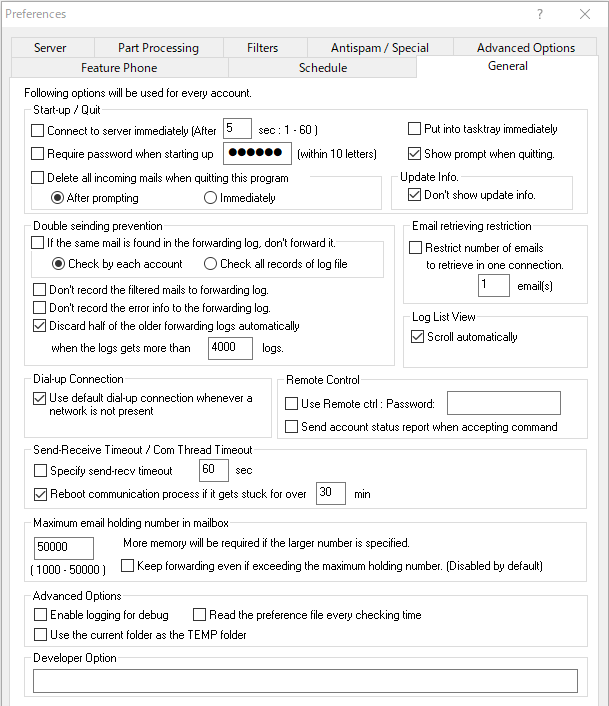 This option allows you to restrict the number of emails retrieved in one connection. In case you are using an unstable analog modem, the connection time can be short and the possibility of connection error is getting small. If the option 'Scroll Automatically' is checked, the log list view will be scrolled to show the latest log at the bottom of the list when updating the list. If this option is checked, the dial-up connection which is set up in 'Control Panel / Internet Options' will be available. The option 'Dial whenever a network connection is not present' must be chosen in the setting dialog 'Control Panel / Internet Option / Connection' of Windows. Use this option if you use the dial-up connection. You must not check this if you use LAN or xDSL, etc. This option can be used to suspend or resume the specified forwarding account by remote control. By sending an email which has the subject with following format, you can suspend or resume forwarding. While an account is suspended, the incoming emails will be filtered and never be forwarded. The following is the subject format for remote control. A space letter should be inserted between each word. "PASSWORD" is the discrimination word and it should be within 8 characters. "2" is the account number to control. This number starts from 0. To control all accounts at the same time, "ALL" can be specified. "OFF" is the command to suspend forwarding. "ON" can be used to resume. PASSWORD 0 ON -> Resumes the account '0'. PASSWORD ALL AFF -> Suspends all accounts. If the same mailbox is specified for multiple accounts, the remote command email will be accepted by every account. If you want to have an account to ignore the remote command email, use the option "Ignore remote control command" of "Advanced options" in the "Options" tab. The remote status of available accounts will be sent to the destination address of this account. The report format is like following. * In case that the account 0,1 and 4 are enabled, and the command "PASSWORD 1 OFF" has been accepted. This option allows you to specify the timeout time for sending or receiving commands to mail server. If you don't use this option, that time will be '60sec'. Unchecking is recommended usually. The communication with mail server is performed by another thread in the Windows system. If this option is checked, the thread will be forced to reboot when the communication process gets stuck for over the specified time. The minimum time is 10 minutes. The usual communication errors will be recovered by the "timeout" option. The case that this option would perform is quite rare. Checking this option and specifying '10-30' min recommended. You need to specify the maximum number of remaining emails in mailbox here. If the number of remaining emails exceeds the number here, the new incoming emails may repeat forwarding. Be sure that if you specify large number, more application memory will be needed. The communication logging file(fwdmail_session.log) will be created in the same directory as "fwdmail4.exe" is placed. It should be used for trouble shooting after registration. Unchecking is recommended usually. The preference file will be read and applied before every time when the forwarding process starts. This option is for debugging use. Unchecking is recommended. The temporary files, which contains the received email body, will be saved in the current folder. If you use an anti-virus software, the temporary files will be removed when infected emails are received. If you check this option and if the anti-virus software is specified to take the current folder off from the virus checking items, you can forward even the infected emails.